The home of Nahla Machmoud and Jamal Yousef Saleh Ahmad in the village of Asira al Qibliya, near Nablus, again came under attack from Israeli settlers from nearby illegal Israeli settlement Yitzhar in the early hours of Tuesday morning, as the family awoke to find their house covered in spray-painted stars of David. Six stars cover the side of their house, with an attempted seventh above the front door. Nahla found the graffiti at 7:30 on the morning of Tuesday 20th May, but is unsure as to when during the night it happened as no one in the family heard it. Nahla, Jamal and their four children have been the victims of attacks from the settlers, and Israeli soldiers who protect the settlers, for the past three years. They finished building their house in 2003, and had two peaceful years, but since 2005 have had regular attacks – the most recent being the shooting of their water tank and the firing of tear gas into their home by Israeli soldiers on Friday 16th May. The attacks usually occur over Shabbat, the Jewish holiday that commences at sunset on a Friday and concludes at sunset on Saturday. However, now it seems as though the settlers are becoming more aggressive, and attacking during the week as well. Nahla is clearly aware of the extent to which she is unable to rely upon the Israeli soldiers to prevent these attacks from taking place, given that the soldiers themselves participate in the attacks, despite the fact that, under the Oslo agreement of 1994, the village of Asira al Qibliya is located in Area B – an area in which the Israeli army are responsible for security. 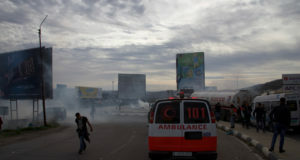 Nevertheless, Nahla calls the Israeli District Coordination Office (DCO) every time there is an attack, but to no avail. 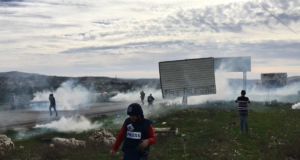 Asira al Qibliya is under constant threat from Israeli settlers and soldiers, with settlers stealing land; preventing villagers from entering lands nearby to the settlement; and entering the village to burn crops and trees, and throw stones at the villagers. 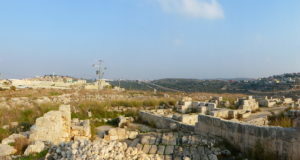 The house of Nahla and Jamal is a prime target for the aggressive settlers, because it sits high on the slope of Mount Salman, and as such is the house closest to the nearby illegal outpost of Yitzhar settlement, that was constructed approximately eight years ago. The villagers are fed-up with this situation that seems to be escalating, despite their insistence of their willingness to co-habitate with the settlers peacefully if such a situation was possible, and as such the village council has sent a request to international embassies and organisations, requesting their help to have the Yitzhar settlement removed, and the land returned back to its lawful owners.